Reports that Australian authorities have handed Tamils back to Sri Lanka spark international criticism. Just when you think Australia’s policies towards asylum seekers couldn’t get any more inhumane, they do. The UN have said it holds “profound concerns” for almost 200 asylum seekers picked up by the Australian Navy as reports emerge they have been handed over to Sri Lanka on the high seas. The asylum seekers were picked up from two separate boats in the Indian Ocean earlier this week, with at least one boat confirmed as having embarked from southern India. Australia has confirmed it has transferred 41 asylum seekers from one of the boats to the Sri Lankan Navy. Those transferred will reportedly face a prison sentence in Sri Lanka. 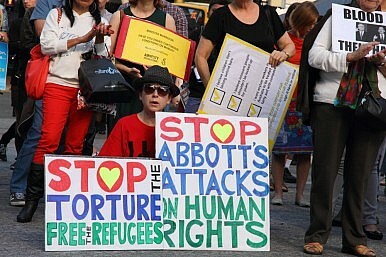 Late on Monday evening the Australian High Court imposed a temporary injunction stopping the government from transferring the 153 asylum seekers from the second boat until the court reviews the matter. “International law prescribes that no individual can be returned involuntarily to a country in which he or she has a well-founded fear of persecution,” UNHCR said. This comes as reports also emerge 11 of the Tamils on board one of the boats have in the past been jailed and tortured by the Sri Lankan government. A Tamil family member of someone on board one of the boats spoke to the Tamil Refugee Council yesterday. “One of [the asylum seekers], a man in his thirties, was arrested in the final days of the war in 2009 and jailed in Colombo, where he was tortured. His relatives had to pay several thousand dollars to get him out of jail,” the man told an interpreter from the Tamil Refugee Council. “He then fled to India. Like many others, he lived there in a refugee camp under threats of intimidation from Indian authorities, who have connections with the Sri Lankan government. It’s why he, along with the others, took this boat to Australia,” he added. Meanwhile earlier this week it was revealed that the Australian government was using teleconference calls with interpreters in Sydney and Melbourne to ask the Tamil men four basic questions to assess their claims. Their name, country of origin, where they had come from, and why they had left were the only questions asked by way of assessment of their claims to refugee status. From this screening process, one of the men on board the boat carrying 41 was judged to be a refugee. He was offered to be transferred to an offshore detention center but chose to be returned to Sri Lanka. The two boats have upset Canberra’s claims of having “stopped the boats” and challenge the government’s policy of forcibly returning boats to Indonesia, the final point of embarkation for most people seeking asylum in Australia. The Australian government tries to avoid the controversy that followed last year’s offering.